Travelling with fellow COFEPOW member John Bessant, we left Manchester Airport on 18th April for Singapore. Here in the early evening the following day we met the rest of our touring party. The total group, British and Australian, consisted of 15 relatives of Sandakan-Ranau victims, a daughter of a civilian internee survivor (Berhala Island/Kuching), group leader Lynette Silver (LS), author of 'Sandakan - A Conspiracy of Silence' and myself, the son of a Sandakan/Kuching survivor. We spent two full days in Singapore with our very knowledgeable local guide, Mr Singh, visiting most of the military connected sites. This included Changi Gaol, Changi Museum, Kranji Cemetery, the sites of the Labrador and Johore Batteries, the beach where the Australian machine-gunners fought the invading Japanese and the site of the Battle of Pasir Panjang where the Malay Regiment stood their ground almost to the last man. The tour also took us through the Indian Defence lines at Changi where the British POWs, on their return from Java, were imprisoned. Curiously, my watch stopped here and only started again when I arrived home two weeks later. The emotions that I felt at Kranji Cemetery are very hard to describe. There on the memorial walls were the names of all my father's comrades who had perished at Jesselton and Sandakan-Ranau and have no known graves, especially the name of his best friend, Les Barnes, killed at Ranau Jungle Camp One on 10th June 1945. John Bessant laid a small bouquet of red poppies on behalf of COFEPOW at the foot of the Cross of Sacrifice. An Australian said the Lord's Prayer. Because of a revision in flight schedules between Singapore and Malaysian Airlines, our transport arrangements had to be revised shortly before we left the UK. Singapore Airlines no longer flew to Borneo so to get there we took a flight by Singapore Airlines to Brunei, then a ferry to Labuan Island spending a night at the Sheraton Hotel. The next day, 23rd April, we flew by Malaysian Airlines to Kota Kinabalu (formerly Jesselton) and then an internal flight to Sandakan. Sandakan Airport, as at Kota Kinabalu and Labuan, is built on the site of the airstrip worked by the POWs. With this thought, my emotions were high as we landed. As we left the airport, LS pointed out a small area of tarmac next to the main runway. It was part of the original airstrip built by the POWs. Just to the right of the terminal building is the site of the first British Compound. We went straight to the Sandakan Memorial Park. We passed the Padang where 'B' Force camped and as we drove we sang Waltzing Matilda, It's a Long Way to Tipperary and other wartime favourites as they had done all those years ago. With everyone's emotions under control (it would not be that way on ANZAC Day) LS guided us round the camp. What a blessing it was to have LS with us - every question answered and each of us talked to individually. The site of the big tree, the area where the sick were left to die, where the last of the sick (an Australian called Skinner) was killed on 15th August 1945, the British Compound (the only compound wholly left within the Park) and the cooking area are all within the Memorial Park boundaries. Outside, and now mostly developed areas, are the sites of Cemeteries 1 and 2 and most of the Aussie Compound. The COFEPOW wooden cross was on display in the small pavilion. Outside is a replica of one of the notorious cages. We spent some time there, most of us silent with our own thoughts, before heading to the Sandakan Hotel. Here we changed into smarter clothes as later in the afternoon we had been invited to a garden party with the Mayoress and other guests. I should add we had now been joined by a Mr Willie Teo, the boss of Borneo Tours. He remained with us for the rest of our stay in Sabah and Labuan. He was brilliant at sorting our daily problems. I had lost the airline ticket for Labuan/Kota Kinabalu. Willie sorted the whole thing in about 15 minutes. Sandakan Town is far from being the prettiest place in Borneo. Put together quickly after the war it is now fairly dilapidated with the smell of the fish market hanging in the air. The wharf where the British came ashore is still there. On 24th April we took two boats and visited Berhala and Libarin Islands. Both islands are part of the Borneo story. For relaxation, we went on to Selangan (Turtle) Island but during the day no turtles can be seen so we lazed on the beach and swam in the Sulu Sea. On the way back to the hotel I left the coach to take a photograph of Sandakan Police Station. This led to my near arrest on security charges; however, in the end all was well! In the evening we were joined on an unofficial visit by a British Colonel and his wife based in Kuala Lumpur, they flew in from Vietnam and from Kuala Lumpur the Australian Assistant High Commissioner to Malaya and his wife. 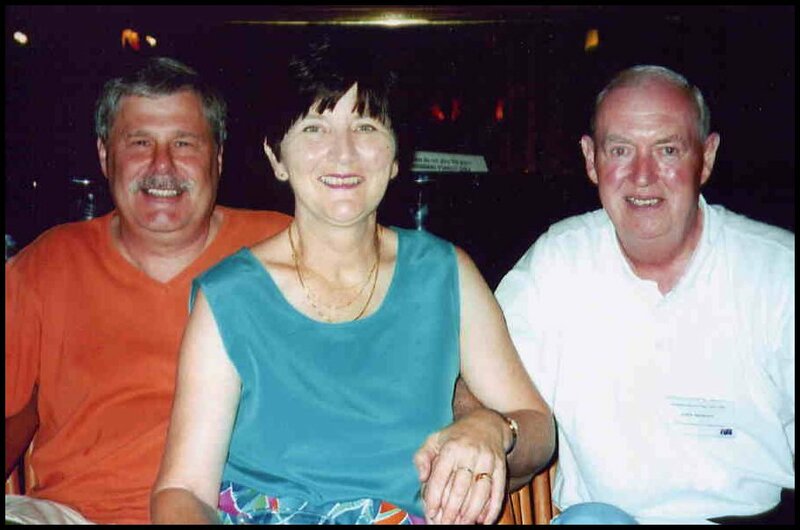 On ANZAC Day, 24th April 2002, we left the hotel at 7am (to avoid the heat of the day) for the Memorial Park Service. All of us, including the new arrivals, took part in the service. My duties were to light the gum leaves and raise the Union Jack, others read poems and prayers etc. It was so emotional with the flowers and the tributes, including a wreath from COFEPOW, laid at the foot of the memorial. Tears flowed from all who stood there honouring all the POWs who died at Sandakan and also those who died on the Death Marches and at Labuan/Miri and Kuching. We left the Park at about 9.30am for a tour of other sites of interest in Sandakan. The Civil Hospital, where my father's fate was decided, Agnes Keith's house and finally St Michael's Church. The British POWs spent their first night at Sandakan in the Church. For one of our party it had a special meaning - Pauline had been christened and her parents married there. After an afternoon spent at the Orang Utan Park, it was good to return to the hotel for a deserved rest. In the evening an ANZAC Tour Dinner was held at a Chinese Restaurant in the town. The next morning, after the Colonel and his wife had left, we boarded the coach to journey along the road to Ranau. The actual Death March route has now been swallowed up by jungle. The road route took us through all the villages and across the rivers. In several places the road crossed the Death March route. We passed through Boto, Telupid, Tampias and Paginatan before reaching Ranau. At the river at Tampias we stopped for the oldest member of our group, 86 year old Sadie Brown. It was near here that her beloved husband perished 57 years ago. Flowers were thrown into the river and a poem read. Before stopping at the Memorial at the site of the first Ranau Camp, we went to visit JC1 (Jungle Camp) and hopefully JC2. This was Lynette Silver's 7th tour and, as yet, no tour had been successful in reaching the site. For me, JC1 was very special for it was here that my father's best friend LAC Les Barnes was killed along with the rest of the men who were too sick to move on to JC2. The site bears no scars now of those terrible events. From there we moved off towards JC2 (don't ask me the directions). The coach finally turned off onto a logging road. In several places the road had collapsed, I guess either through flooding or the weight of the lorries. At certain points the driver would stop and get out with his boy helper to judge the degree of difficulty. It was his coach and he was not going to wreck it for us. On our left was a valley covered in thick jungle and somewhere down there was JC2. Somehow the driver got us through and there we were looking down on the site where the last men on the Death March spent their final days. The beauty of the jungle could not mask the finality of this place. We then returned to the Ranau Memorial for a service similar to the one held at Sandakan. By now we were ready to release our emotions and there was not a dry eye around. Again we left a wreath in the name of COFEPOW and, as if to show support, the low cloud lifted and Mount Kinabalu looked down on us. That night we stayed at Kundasang which gave us great views of Mount Kinabalu. Next morning we went to the Mount Kinabalu National Park for a short walk and then on to Kota Kinabalu (KK). In the afternoon we visited the sites of the gaol/barracks where the British were held before they moved to Sandakan. KK is a fair size and the shoppers amongst us enjoyed themselves. I was quite happy going around the book-shops with LS. The next day, 28th April, in the morning we left for Sapi Island and a few hours leisure. We left from the wharf where the British POWs arrived in KK. We had taken a taxi from the hotel and during the short ride the POWs were mentioned. The young lady taxi driver was interested and said her uncle had been a POW. Neither she nor her family knew anything about him. His name was Soorier. LS and the rest of us could not believe it for Soorier was the only Indian among the RAF men at Sandakan. Our driver was overjoyed and after taking LS's details, she dropped us off and returned to her family to tell them the news. In the afternoon we took the ferry back to Labuan Island (at least this time we could see out of the portholes). We left our hotel early the next day for our visit and service at the Labuan Cemetery. On the way we passed Brown Beach and Russel Point where the liberating Australians landed. This landing sadly led to the execution of the surviving POWs in Labuan. Again tributes, flowers and a wreath from COFEPOW were laid at the Memorial and a very sad and tearful service took place. Afterwards, we all spent time wandering through the graves and John and I found his father's grave. I left him to have those first moments alone. The cemetery is superbly maintained and although next to a road, I did not hear the traffic for this was such a beautiful and peaceful place. By now the sun was burning so we returned to the hotel. In the afternoon I took the option to return to the cemetery to find other specific graves and to wander among the other graves recognising names from LS's and Don Wall's books. That night there was to be a farewell dinner although five of us (three Aussies, John and myself) were going on to Kuching, Sarawak. However, we were in for a surprise when the coach drew up outside a house and Willie Teo invited us to join his family for a buffet dinner. Mr Tai, the Labuan Cemetery Manager, and Hubert Wilfred, the Sales Manager at the Labuan Sheraton Hotel also attended. It was a very good evening with everybody enjoying themselves. The returning Australian party left at 8am the next day. Our flight to Kuching via Miri was not due to leave until 6pm and John and I agreed to have an easy day. We took a taxi for an island ride stopping at the Peace Park and the Memorial marking the point of the Japanese surrender. Our 2-hour flight was delayed 3 hours, finally leaving at 9pm. No sooner were we airborne than we landed at Miri in Sarawak for an Immigration check. We got off the aeroplane, walked to the Immigration building, the papers were checked and then we re-boarded our flight for take-off. It was extremely hot. We finally arrived at our Kuching hotel at midnight. The hotel was right on the Kuching River with sampans going up and down. Fort Marguerita was on the opposite bank. In the morning we visited the Sarawak Cultural Park and Show. The Park had different native houses with different tribes showing local skills eg birds nest soup-making, blow-pipe use and making sago biscuits. The show included dancing, singing and tumbling etc in wonderful traditional dress. We had the afternoon to ourselves. On 2nd May we left for a Kuching (Cat) City tour. There are monuments to cats everywhere. We went to the famous Kuching Museum and to the Heroes Grave. This grave contains the natives who were executed for their part in the Sandakan radio incident and who travelled with my father from Sandakan to Kuching via Miri. From here we went to the Lintang POW site, now a Teachers Training School. The original Punjabi POW hut is still there although now with a galvanised roof. The old gate posts, gate bunker and stump of the Jap flag pole all remain. A small museum holds photographs of the British Camp, British Officers Hut and Frank Bell Underground University Certificates. For Pauline, the civilian internee's daughter, and myself this was the site of our fathers' liberation. We spent a lazy afternoon - John and I both feeling very weary. The next day, 3rd May, was the start of our journey home. We caught the 11am flight to Labuan (including the Miri merry-go-round). We spent our fourth night at the Sheraton and were treated as old friends by the bar staff. The next day we left for the Labuan ferry to Brunei and our next flight to Singapore at 1.40pm. At Singapore we said goodbye to our fellow travellers, who were having another night in Singapore, while John and I headed for the Transit/Departure Terminal. Our flight was not due until 10.15pm but at least there is plenty to do at Changi Airport. We came home via Bombay, arriving in Manchester at 7.50am, absolutely exhausted. We went to John's house for a bacon butty and goodbyes before my drive home to the New Forest. I arrived home safely, tired after 40 hours travelling, but I would not have changed a thing. The trip was totally worthwhile for all that I saw, for the emotions I felt, for bringing me closer to my father and the other POWs and for waylaying the ghosts that had been with my family for years. Finally, I would like to say thank you to John and the Aussies for being great travelling companions and to Lynette Silver for being a wonderful Tour Leader.